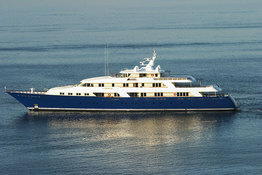 The owner's of the yacht are Joanne and Graham Berwind. I've been on the boat before, it is amzing. It has five floors and 1 floor is only for the guests. We went to the Bahamas on it and had a blast. I feel lucky to know these people. Presently at Canary Wharf - London, has been since Monday. She is moored in West India Millwall Docks(Across the way from the Millenium Dome) ATM and has been there for three days. Beautiful specimen and such a graceful sight in the dark hours, especially against the backdrop of the Canary Wharf buildings!